The altar may be decorated with flowers on this day. The full text of the Roman Canon, with proper Communicantes, is found with the prayers for the Mass of the Lord’s Supper. The procession with the Blessed Sacrament and period of adoration does not occur if the celebration of the Passion of the Lord will not take place in the same church on Friday. On this day and Holy Saturday, no sacraments may be celebrated except for Penance and Anointing of the Sick. Communion may be brought to the sick and dying on Good Friday, and may be given only as viaticum on Holy Saturday. A former provision for a priest to select certain intercessions, rather than pray all of them, is no longer present. The priest celebrant may remove his chasuble and shoes when adoring the Cross, if appropriate. The provision for the use of multiple crosses in the United States has not been renewed. One Cross or Crucifix should be adored, in one of the two forms described in the Roman Missal. The Rite concludes with a genuflection to the Cross. The Easter Vigil begins with a sign of the Cross. The Preparation of the Candle (“Christ yesterday and today…”) is no longer optional. The refrain “The Light of Christ” is sung at the door, at the middle of the church, and at the altar. If there is no deacon, another minster carries the Paschal Candle (the priest no longer does this). At the conclusion of the procession with the Paschal Candle, all the lights throughout the church are lit, with the exception of the altar candles. The incensation of the Exsultet text and Paschal Candle are no longer optional. Special commemorations are made of the baptized and their godparents in each Eucharistic Prayer, as given in the Ritual Mass, “For the Conferral of Baptism”. The reception of Holy Communion under both kinds is desirable for the newly baptized, their godparents, Catholic parents, spouses, and catechists. Where the occasion suggests, it is appropriate that all the faithful also be admitted to Holy Communion under both kinds at the Easter Vigil. 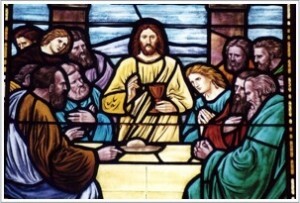 If desired, the renewal of baptismal promises and the sprinkling rite may take the place of the Creed on Easter Sunday. If this option is taken, the rite from the Easter Vigil is used. On Easter Sunday, the Solemn Blessing from the Easter Vigil may be used.